We recommend checking out our discussion threads on the Prompter People Flex 15 Two Teleprompter Kit KIT-ED-FLEX215, which address similar problems with connecting and setting up Teleprompters Prompter People. The user manual for the Prompter People Flex 15 Two Teleprompter Kit KIT-ED-FLEX215 provides necessary instructions for the proper use of the product Professional Video - Studio & EFP Equipment - Teleprompters. The Prompter People Flex 15 Two Teleprompter Kit includes 2 Flex 15 teleprompters, 2 Flip-Q Pro software licenses, 1 Flip-Q Lite software license, two 25' (7.6 m) VGA cables, 1 REM-GRF controller, and 1 DA-VGA distribution amplifier. 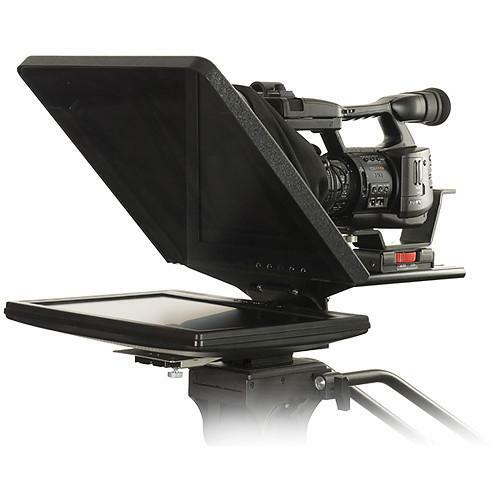 With a 15" (38 cm) LCD screen, the teleprompter supports any DV camera ranging from MiniDV to ENG, and DSLR cameras, and offers a visual range up to 18' (548.6 cm). Providing balance when used with any camera, it comes with an aluminum extrusion frame. An anti-reflection coating in the rear of the screen prevents reflections on the lens. Featuring a completely tool-less design, the Flex Series Teleprompter allows for a quick setup, and can be easily folded for secure transport and storage use. Height and angle adjustment allows the Premium HD 60/40 adjustable glass beamsplitter to be tuned to ensure that the camera is centered and suited to the presenter’s viewing angle. This freestanding "run & gun" model teleprompter supports composite and VGA inputs. The Flip-Q software, with a dual screen scrolling engine, reverses the secondary PC or laptop output without reversing the operator's display. This enables the use of less expensive non-reversing VGA displays without sacrificing the functionality or performance. It features an RTF text editor, and allows you to import RTF and TXT files. Additionally, the software offers color background, color fonts, preset font size, color, style, black and white fonts, user selectable cue points, run lists, run from selected cursor and selectable cue marker. Flip-Q features mirror secondary display, quarter size operator display, sensitivity control, UNICODE support, and foot pedal support. In addition, the software also features find, replace, and undo functions, wireless controller option, text justification, variable line spacing, and interface in 9 different languages. If you own a Prompter People teleprompters and have a user manual in electronic form, you can upload it to this website using the link on the right side of the screen. Box Dimensions (LxWxH) 30.5 x 20.3 x 12.8"
The user manual for the Prompter People Flex 15 Two Teleprompter Kit KIT-ED-FLEX215 can be downloaded in .pdf format if it did not come with your new teleprompters, although the seller is required to supply one. It is also quite common that customers throw out the user manual with the box, or put the CD away somewhere and then can’t find it. That’s why we and other Prompter People users keep a unique electronic library for Prompter People teleprompterss, where you can use our link to download the user manual for the Prompter People Flex 15 Two Teleprompter Kit KIT-ED-FLEX215. The user manual lists all of the functions of the Prompter People Flex 15 Two Teleprompter Kit KIT-ED-FLEX215, all the basic and advanced features and tells you how to use the teleprompters. The manual also provides troubleshooting for common problems. Even greater detail is provided by the service manual, which is not typically shipped with the product, but which can often be downloaded from Prompter People service. If you want to help expand our database, you can upload a link to this website to download a user manual or service manual, ideally in .pdf format. These pages are created by you – users of the Prompter People Flex 15 Two Teleprompter Kit KIT-ED-FLEX215. User manuals are also available on the Prompter People website under Professional Video - Studio & EFP Equipment - Teleprompters.